As per the answers to Travelling by train in mainland Europe, will I save money by booking my tickets early?, you should normally book your Eurostar tickets in advance, ideally a few months out (especially for popular trains). It's basically the same thing whichever day I pick - normally only one train offers any class other than standard, the rest only offer non-flexible tickets at an apparently fixed price. Given that, is it possible to just turn up at Brussels station a bit more than 30 minutes out from the train I end up wanting, buy a ticket for this price and travel? Or do I still need to book online in advance (for one specific train since there's almost no flexible ones) to get this £24 price? These tickets are a little bit special, in many ways, and seem to be rather difficult to actually book. 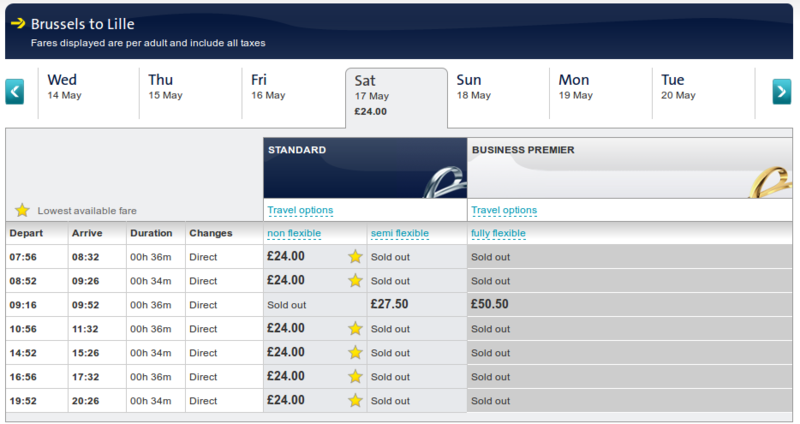 The prices are given on the Eurostar Belgian website (but not most of the other Eurostar sites! ), and are €25 / £24 for a non-flexible ticket. SNCF unsurprisingly said to ask Eurostar, and offered my tickets instead on the TGV 30 minutes before I wanted to travel. Next up was Eurostar Belgium, who suggested I tried their website, or tried ringing the UK. They said tickets did exist, but that the Belgian call centre wasn't allowed to sell them. Other answers have detailed what is going on with these tickets, let me explain why. These tickets are strange because of the so-called "Lille Loophole". Passengers from Brussels to Lille are making an cross-border intra-Schengen journey and therefore do not have to show their passport to travel. This means that people who are not entitled to travel to the UK could board this train. Prior to the changes in 2013, they could also purchase a Lille-London ticket for the same seat, stay on the train and then enter the UK without passing UK border control. The result of this was that UK Borders Agency, in 2011, started conducting passport checks on all passengers disembarking from Brussels-Lille trains (ie all Brussels trains) which was an inconvenience for cross-tunnel passengers - which is the majority of passengers on those trains. Brussels-Lille (and Brussels-Calais) passengers are the only passengers on Eurostar that don't pass through the tunnel, and Eurostar wanted to refuse to carry them, but the Belgian and French governments wouldn't permit them to do that (it would force them to run more TGV and/or Thalys trains to provide a replacement service). Eventually the compromise was reached in 2013 that Brussels-Lille passengers are all held in a single, separate carriage and that carriage is cleared out at Lille to ensure that passengers can't stay on the train to the UK. If you want to break the journey in Lille, you have to buy separate tickets, leave the platform and pass through security and immigration controls before boarding your train to the UK - which will certainly be a different train, as there's no way you can do all of that in the time that a train spends at the platform. Tickets in the opposite direction (ie Lille-Brussels or Calais-Brussels) are perfectly normal tickets, as there is no worry about passengers remaining on the train. This means that you can travel first class (only Standard Premier, not Business Premier) from Lille to Brussels but not the reverse - this is why you will sometimes see first-class tickets for this route listed; you can go first class in one direction but not the other. Note that Eurostar cannot be used for domestic journeys, ie Calais-Lille, Ashford-London, Ashford-Ebbsfleet and Ebbsfleet-London. The Belgian Eurostar website suggests that there are in fact only two prices and one class (compare that with tickets to London, where the price quoted is only a minimum “à partir de”). Note that the Brussels/Lille link has been contentious, with commuters and local politicians in Belgium and France wanting easy access and Eurostar and the UK authorities lukewarm to the idea over concerns that people could board the train with a ticket to Lille and continue to London without proper documentation. Consequently, the specific conditions (passport check or not, which trains and classes are available, single ticket or commuter's season ticket) have changed over the years. For security and border control reasons, any booking for travel from Brussels to Lille or Calais is available in Standard class only and limited to coach 18. During your journey between Brussels and Lille or Calais, movements to and from this coach will be controlled. You must cooperate with our on-board staff and agents, as well as security and border control authorities in the stations in relation to these requirements. So you can't buy a standard or business premier ticket or even get a seat anywhere else than in carriage 18. You also have to show up at another entrance (“Terminal intra-Schengen”). Not the answer you're looking for? Browse other questions tagged trains tickets brussels eurostar lille or ask your own question. At Brussels Midi station, can you access the Eurostar Business Premier lounge when going to Lille or Calais?